Nerf this week introduced a new addition to its Rival line and it’s capable of holding 100 foam balls at a time, which means you won’t have to futz around with reloading a clip of ammo. Just drop the ammo in and you’re good to go. That’s the beauty of the Nemesis MXVII-10K. Because it’s fully-automatic, users just load up and pull the trigger. 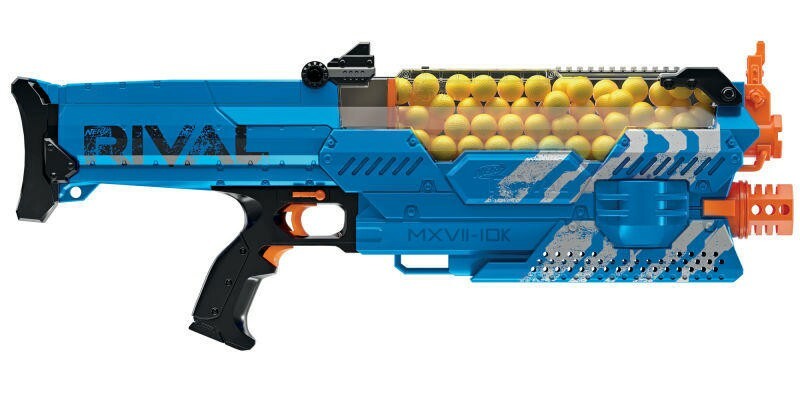 Similar to other Rival blasters, the MXVII-10K can shoot Nerf’s foam balls at a ridiculous but completely necessary 70 miles per hour. When you’re in the thick of a Nerf fight, you’ll need all the advantage you can get. But in order to power the blaster, you’ll need a whopping six D-sized batteries. Yeah, the gun will probably be pretty heavy when you’re fully locked and loaded. If you want to be the envy of your next sleepover, the MXVII-10K is the surest way to win friends and destroy your enemies. Now, if only there was an easy way to track down the foam balls after shooting them. That’s what smaller siblings are for.